Home > Wolfgang Product Line > Wolfgang Leather Care Cleaner 128 oz. Refill Free Bonus! For a limited time, Receive a FREE 12 oz. refillable bottle with your purchase of the gallon size of Wolfgang Leather Care Cleaner! Now there is no need purchase a separate bottle, just to use your favorite Wolfgang Product! 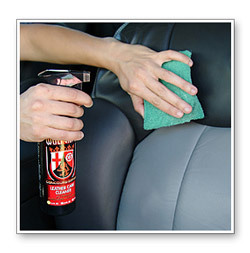 Clean and pamper leather seats with natural cleaning agents. Wolfgang Leather Care Cleaner is a pH balanced, biodegradable leather cleaner that relies on natural citrus to lift dirt and oils out of automotive leathers. Wolfgang Leather Care Cleaner removes stains and oils without drying, leaving your car's leather looking and feeling like new. Keep your leather looking its very best with 100% biodegradable Wolfgang Leather Care Cleaner. This pH balanced cleanser utilizes the natural cleaning strength of citrus to remove virtually any dirt, grease, ink, oil, or spills from your leather. It works by penetrating deep into the pores and gently lifting away foreign particles, pollution and contaminants, including microscopic dirt particles that build up over time. Cleaning your leather regularly, regardless of visible grime, is important for the long-term life and vitality of the leather. Wolfgang Leather Care Cleaner is specially formulated to be gentle enough for regular leather maintenance, but strong enough to remove the most stubborn spots and stains without leaving a trace. We suggest treating any mishaps as soon as possible. Used properly, this water-based leather cleaner will not dull, stain or dry out leather. After using Wolfgang Leather Care Cleaner, the surface of the leather is dirt-free and subtly fragrant. Follow up with Wolfgang Leather Care Conditioner for maximum enhancement and protection. Wolfgang Leather Care Cleaner replaces these unsafe chemicals with German-developed, non-ionic surfactant and non-alkaline cleaning agents. Our water-based formula is a pure cleaner, which contains no petroleum distillates, silicone oils or gloss agents. Wolfgang Leather Care Cleaner is a safe, state-of-the-art, deep cleaning formula. 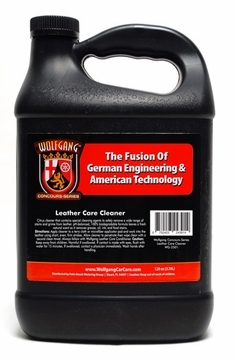 Apply Wolfgang Leather Care Cleaner to a damp terry or microfiber applicator pad. Work cleaner into the leather using short, even firm strokes. Pay attention to excessively dirty or stained areas; agitate with a soft upholstery brush. Allow cleaner to penetrate for a few minutes, then wipe dry with a clean microfiber towel. Do not let the cleaner dry on the leather. Follow with a Wolfgang Leather Care Conditioner to protect and soften the leather. 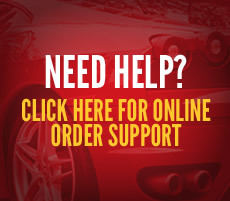 These two steps will keep your vehicle's leather seats in pristine condition. Tech notes: While Wolfgang Leather Care Cleaner is as powerful as professional detailing leather cleaners, there are a select few stains that it, or any other cleaner, cannot remove. As with all cleaners, check for colorfastness before using for the first time. Wolfgang Leather Care Cleaner should not be used on napped leathers like suede or glove soft leathers. Leather that is in a hard, cracked condition cannot be restored by this product or any other means.